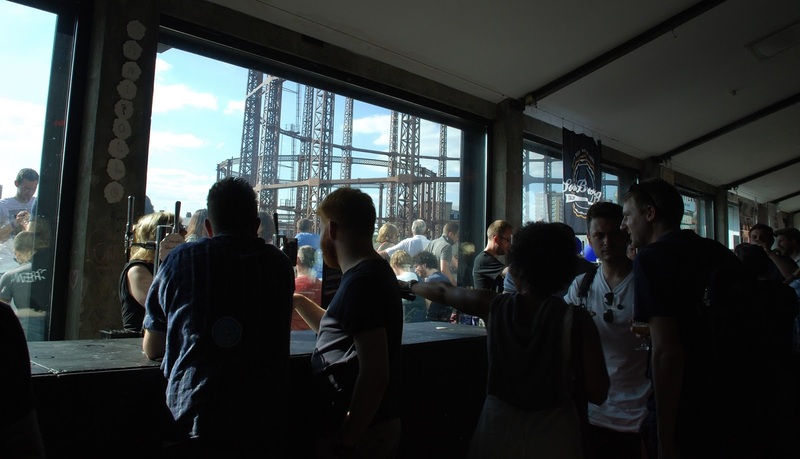 The Oval Space – MostlyAboutBeer……..
It’s just the name I don’t like. It’s too contrived. The Old Gasworks would’ve been better. 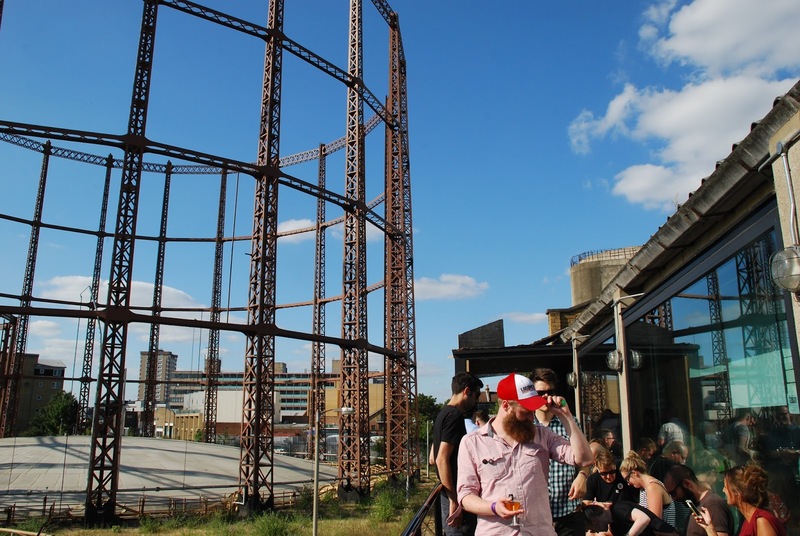 I came here to experience the London Craft Beer Festival – just follow this sentence. I hadn’t counted on the awe of the Oval Space. I’ve tramped up and down Mare Street many times completely unaware of the sleeping giant in the neighbourhood. You see a gas holder cage as you approach the venue but it seems underwhelming, barely peeking over the low buildings you walk by. It’s only after you’ve crossed the threshold of the Oval Space that reality distorts with crab nebula beauty. Once you enter the building and go up a flight of stairs, the wall and roof are cut away. 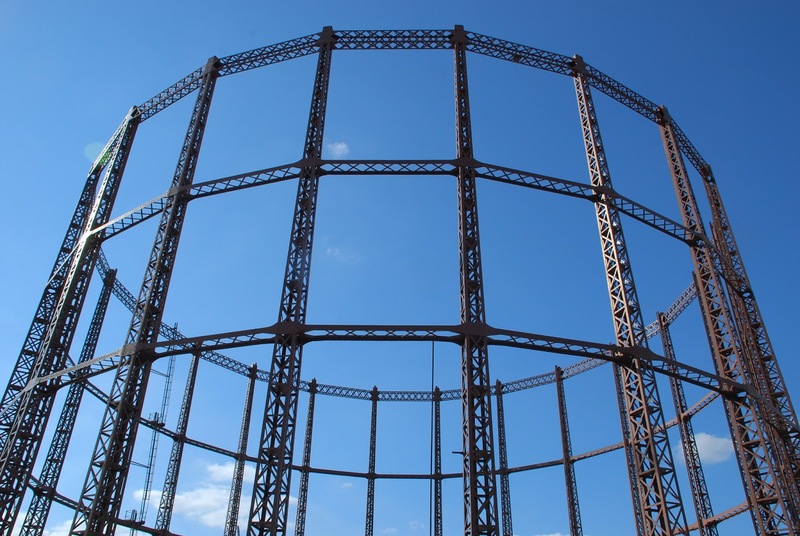 The sky becomes the ceiling and the wall becomes a breathtaking industrial panorama: you gaze directly at the metal skeleton of gas holder 5 in what used to be the Bethnal Green gasworks and the blazing azure summer framing it. You’re bathed by it. As you look up from your low elevation, it’s like you’re kneeling in its presence. Though we don’t think of them as such, Kentish oast houses and Norfolk windmills come from the industrial age. The gruelling days of physical labour we have the fortune never to have known in our own lifetimes have robbed these buildings of the oppression they once bore. in the 21st century, they’re the rustic postcard pin ups of the English landscape. So it might be for gas holder 5 built in 1889 – the smaller tower – holder 2 that stands behind it is a couple of decades older. 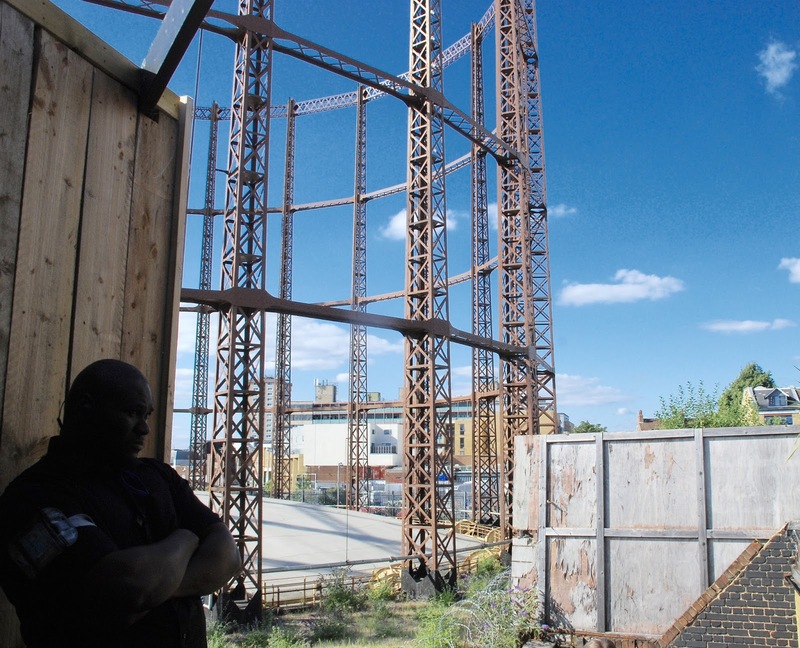 Though we still have working gas holders or gasometers, they’re gradually departing the scene splitting people between those that would love to see them demolished and those that nail their hearts to them. In just over a decade, I’ve experienced the same regard towards the buildings of Battersea power station. Some feats of architecture were never meant to stun but do so in their industrial largesse. Others diminish like Marble Arch. It’s now dwarfed by the buildings that surround it and seems so puny. Gas holder 5 reminds me of something ritualistic – a circular standing formation. Arenas in the Acropolis, the Colisseum, the Calanais standing stones on the Isle of Lewis, a circle at Carnac, Stonehenge. I can imagine sacrificial offerings being made under its steel struts at the winter solstice. Maybe what makes this metal guardian so compelling is that it’s fading into history as you look at it like a relic in the making. You can see it turn sepia and the periphery of your vision curl and brown like an old photo. The Oval Space has the biggest lounge conversation piece on the planet. Please let’s not demolish it.